The left file photo shows a Delta terminal from the LaGuardia airport in New York City on August 8, 2016. Tamar Braxton, right, arrives at a BET Awards Dinner on June 21, 2017, in West Hollywood, California. 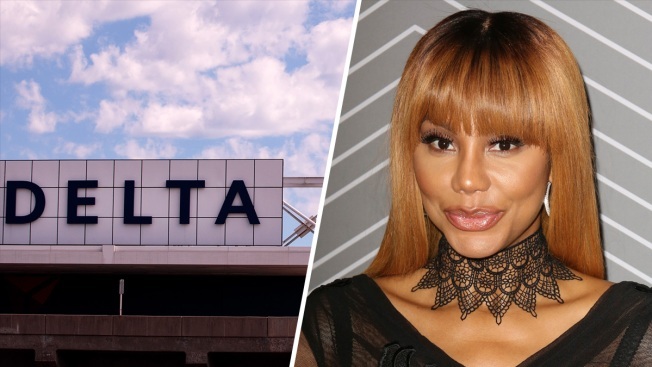 Singer Tamar Braxton was approached by a pilot and “ridiculed” on a Delta Airlines flight, her sister said in an Instagram post. In a video posted to Towanda Braxton’s Instagram page, a pilot is recorded talking to Tamar about listening to flight attendants. The man in the video instructs Tamar not to ask him any questions. After Tamar said yes, the pilot walked toward the front of the plane. Then, Tamar and Towanda discuss whether they should remain on the flight. However, the airline told NBC that the conversation in the video was preceded by the pair’s “unusual” behavior during the boarding process. Before the boarding door was closed, the sisters indicated that they wanted to get off of the plane. Flight attendants instructed them to collect their bags and do so, but the siblings said they weren’t planning to take their belongings, prompting a back-and-forth exchange. Deplaning without your bags is a federal violation, the airline said. The confrontation shown in the video came after the sisters refused to acknowledge the flight attendants’ instructions, according to the airline. As a result, the flight attendants pursued the captain’s help. The airline said the sisters are frequent travelers and would be used to and familiar with crew members' instructions and protocol. The Delta flight was traveling from Minneapolis to Las Vegas and had about 170 passengers. Tamar's representative hasn't returned NBC's phone call or responded to an email inquiry seeking comment on the incident.